Discussion in 'Android Themes' started by johnny quest, Aug 16, 2010. I don't know if this is the right thread. Since I'm new to the Android world and not knowing how to create themes or Roms, I'm coming from the iPhone world, I'm creating icons until I get a handle on theming for the android. Here is a theme I'm working on for the iphone but decided to make icons for the Android. This is a work in progress so please no harsh comments only constructive crits. ardchoille, miyooper, mich2ga and 2 others like this. I like them a lot! Any way we can see more of them? Thanks. I'm working on some more icons as we speak. I just needed to get some sleep. I will post some more icons later on. very cool. I like them a lot! I'd be down for those when you get them finished. Here are some more icons. Its almost done. Hope you like. These icons are almost done. Will release tonight or tomorrow. Any requests please let me know. I am creating the basic ones for now. I have a total of 33 icons done. This is just a layout of how it looks like. I still need to make adjustments on it, but this is what I've done so far. If I can learn how to create a theme for one of these Home apps then I can go on and do more on it. Any tips? Where are the download links??? I want!!! Looks really good, wow! thanks, I'm just about done with this made 65 icons so far and just creating some more to fill in some apps. I would love to create it for a Home(Launcher, Home++, GDE, Open home, etc....) but don't know the process. I will post it up. would you mind is i ripped the icons or should i wait? I prefer blue but your stuff looks awesome! ^yes! lookin forward to a blue zone icon pack! Very nice looking layout. More colors would be nice. Good luck. thanks everybody. Since I don't know how to create a theme for any Home app, I'm gonna have just release the icons. I would love to create it as a theme but still new to the droid world. I'll release the green zone and then will release the other colors as well. thanks for your interests. I'll release Green Zone icons tomorrow. Any request let me know. ok so were can i get these icons they are awesome! I just put the icons and docks on the first post. Thanks for your interests. Again, if there are requests let me know. These are awesome. I'm glad I stumbled upon them. 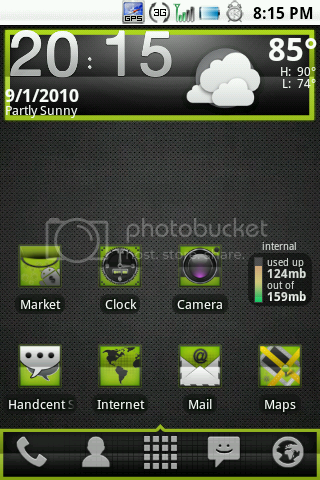 Searching for green icons and found these. Definitely need more icons now. I wish I could help make more, but I have no idea what to do or where to start. Please make more icons. Maybe a different phone icon and battery usage icon? I suppose any and all the most commonly used icons would be great. You have alot, but more would be great. Thanks Buddy. Edit: I know I'm reviving a pretty old thread but I followed a link from an XDA Icon Thread, and I thought maybe someone here could help me find these icons.